1 Bedroom Ground Floor Flat For Sale in Sheffield for Guide Price £65,000. ONE BEDROOM GROUND FLOOR APARTMENT, BENEFITS FROM A RECENTLTY EXTENDED LEASE NOW 149 YEARS WITH A PEPPERCORN GROUND RENT OF ONLY 25 pa . THE PROPERTY ALSO BENEFITS FROM OFF ROAD PARKING AND ITS OWN GARDEN. NO ONWARD CHAIN INVOLVED! An early viewing is highly recommended for this ground floor one bedroom apartment. 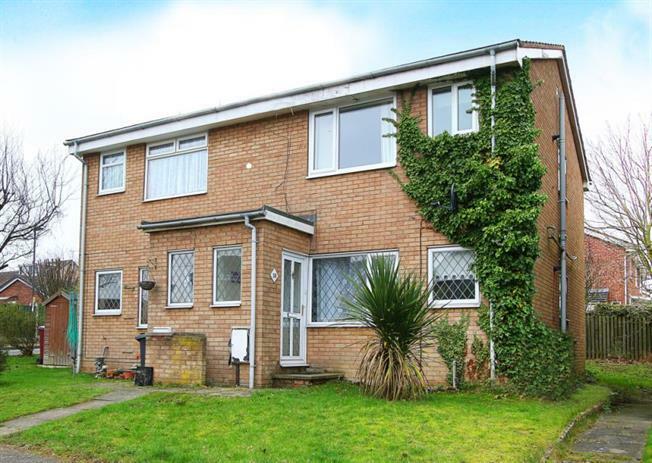 It is situated within the sought after area of Eckington. The property is well presented with the kitchen offering scope for upgrading to a buyers own personal taste and requirements. It will be of particular interest to a variety of purchasers including the first time buyer and or investor alike. The accommodation in brief comprises: Entrance porch leading to the front facing, light and airy living room with wood laminate to the floor and fire surround. Two walk in storage cupboards provide ample storage space. A door leads into the front facing kitchen, which has a range of wall and base units, work surfaces incorporate a single stainless steel sink with mixer tap and drainer unit. There is also an electric cooker point and space and plumbing for an automatic washing machine. A rear facing double bedroom has wood laminate to the floor. The fully tiled white bathroom comprises of a wash hand basin, low flush toilet and bath with over head electric shower. Externally: There is a garden area to the front of the property and off road parking.